The Taubman Institute is seeking to support new or existing teams of scientists to develop novel and impactful approaches to integrate their research programs into the clinic setting. The goal is to perform systematic, multiscale phenotyping to gain insights into individual variation in the susceptibility, progression, course, or outcomes of disease. The institute will partner with investigators to support the development and implementation of their research programs. This will include, but not be limited to, development of a research plan, identification of research partners within and external to U-M, infrastructure and database development, support for clinician and ancillary personnel in the clinic, clinical data collection, biological specimen collection, remote data collection, initiation of research plan, and data analysis. individual in order apply interventions that lead to the prevention, improved treatment, or cure of disease. The institute anticipates investing up to $2.5 million per year to support the funded projects. Present medical care is limited in its ability to provide individualized treatment or prevention of disease. In part, this is due to a relatively small number of clinical measurements that are used to quantify relative health, and to predict disease onset, relapse and response to treatment. The result can be over- and under-treatment, ineffective and inappropriate interventions resulting in increased medical costs, and frustration among patients and providers. The tremendous advances in our ability to obtain and integrate large amounts of clinical, molecular and biobehavioral data for an individual presents the opportunity to derive novel insights into factors that define the true state of the individual, and how these factors differ in their susceptibility, progression of disease, and response to disease interventions. The ability to phenotype patients is often limited by space, clinician time, support personnel, clinic demands, phenotyping infrastructure, database availability, bioinformatics support, etc., that are difficult to put into place, but would be important to obtain external funding. The Taubman Institute hopes to help fill these gaps. The Taubman Institute welcomes applications from existing teams of active collaborators, newly formed teams, or from individuals who have novel ideas. 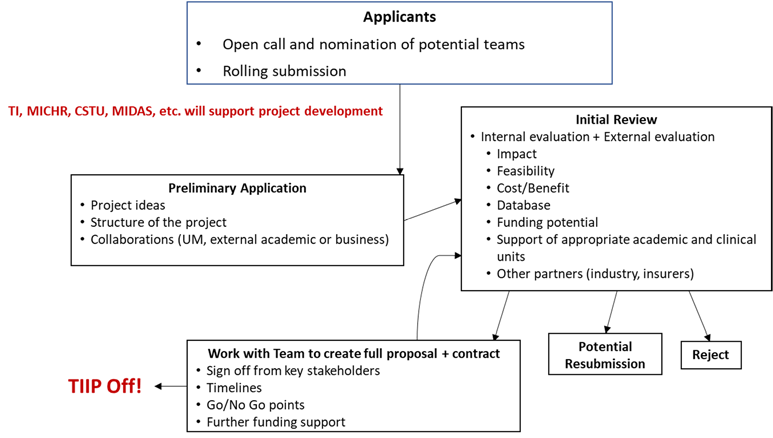 The Taubman Institute envisions an iterative process (see figure). Initial letters of intent will be reviewed by the institute and its appropriate partners, with the teams having the opportunity to provide clarification. Meritorious applications will be asked to submit a more extensive proposal which will provide details of the primary aspects of the project and funding needs. The projects selected for advancement to the second phase will be invited to work with the institute to develop a plan for potential implementation. These proposals will be evaluated by internal and external experts and other relevant stakeholders prior to final decisions regarding funding. Who is going to work together and what will be their roles? Have you worked together in the past? Where do you want to perform this work? What infrastructure is needed to accomplish the goals? Who will you need to partner with to succeed? What are the present barriers to your success? What are your plans for downstream funding? Note: not all of these points must be addressed in the LOI. We seek to understand your vision for bringing science into the clinic. The main request here is for an outline of what you want to do and why it will be impactful. There is no deadline. Letters of intent are accepted on a rolling basis, and should be submitted to managing director Grace Wu (glwu@umich.edu). (glwu@umich.edu). We’re happy to meet with individuals or teams to discuss ideas.